NEW FOR 2018/19 season – STILL RECRUITING. 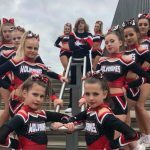 This competitive development squad aims at teaching our younger athletes the basics with a view to introduce them to competitions when the coaches feel they are ready. Train Mondays and Wednesdays 4.00-5.00PM.